Every task is important, but only some of them are critical. The critical path is a chain of linked tasks that directly affects the project finish date. If any task on the critical path is late, the whole project is late. The critical path is a series of tasks (or sometimes only a single task) that controls the calculated start or finish date of the project. The tasks that make up the critical path are typically interrelated by task dependencies. There are likely to be many such networks of tasks throughout your project plan. When the last task in the critical path is complete, the project is also complete. Learn more about critical path analysis. The Gantt Chart view will likely be your most used view for showing the critical path. Choose Format, and then select the Critical Tasks check box. Tasks on the critical path now have red Gantt bars. You can see the critical path in any task view by highlighting it. On the View tab, pick a view from the Task Views group. Staying on the View tab, select Critical from the Highlight list. The critical path shows up in yellow. To see only the tasks on the critical path, choose the Filter arrow, then pick Critical. Tip: In a Network Diagram, tasks on the critical path automatically show up in red. No highlighting is needed. This video demonstrates how to display the critical path in your project, in both the Gantt Chart view and other views. When you’re managing a master project, whole subprojects can be on the critical path. You can see if this is true by telling Project to treat the subprojects like they are summary tasks. Choose Schedule, and then scroll down to the Calculation options for this project area. Make sure the Inserted projects are calculated like summary tasks box is selected. Tip: This setting does not affect other projects. That is, it only applies to the master project you’re working on. Typically, critical tasks have no slack. But you can tell Project to include tasks with one or more days of slack on the critical path so you can see potential problems coming from farther away. Choose Advanced, and then scroll down to the Calculation options for this project area. Add a number to the Tasks are critical if slack is less than or equal to box. You can set up your project schedule to display as many critical paths as you need to keep tabs on your project. Choose Advanced, scroll down to the bottom, and then select Calculate multiple critical paths. Choose Format, and then select Critical tasks. To make sure each subproject of a master project is on time. To track the progress of different phases or milestones. To keep an eye on any series of tasks for any reason. Project management tip: When viewing multiple critical paths, don’t forget that there's still only one main critical path. If it falls behind schedule, the whole project falls behind schedule. Try these tips to make better use of multiple critical paths in a project once you’ve set them up. Choose Schedule, scroll to the bottom, and then select Inserted projects are calculated like summary tasks. On the Gantt Chart, choose View > Filter > Critical. To display all tasks again, select No filter in the filter list. On the Gantt Chart, choose View > Group By > Critical. To display all tasks again, select No Group in the group list. Regularly view the critical path. Be aware that the critical path can change from one series of tasks to another as you progress through the schedule. The critical path can change as critical tasks are completed or as other series of tasks are delayed. Closely monitor critical tasks. Any task on the critical path is a critical task. Monitor these tasks regularly to see if any of them slip. If a critical task slips, so does your finish date. Save a baseline and use the Tracking Gantt view to see slipped tasks. Review series of tasks that may become the critical path. If a non-critical series of linked tasks slips its dates enough, that series of tasks will become the critical path. You can view other potentially risky tasks by showing multiple critical paths in a project. Protect yourself by viewing tasks that can slip without affecting the critical path. By default, the critical path shows the tasks that cannot slip at all or the project date will slip. You may want to view tasks that currently can slip by a day without affecting the critical path, because if they slip by more than a day, they will become critical tasks. Viewing these tasks with slack helps alert you to tasks that are becoming critical while you still have some buffer. Tip: To change the sensitivity of critical tasks, choose File > Options > Advanced. In the Tasks are critical if slack is less than or equal to list, enter the number of days under which a task will be considered critical. When you display the project's critical path, Project shows only a single, overall critical path, which is the only critical path that controls the project's finish date. However, you can set up your plan so that you can also see an additional critical path for each independent network or each series of tasks. You might find this useful for keeping track of each of the subprojects within a master project, or of each phase or milestone of a project that is divided into multiple phases. By knowing and tracking the critical path for your project, as well as the resources that are assigned to each critical task, you can identify the tasks that can affect your project's finish date and thus discover whether your project will finish on schedule. Learn more by reading Manage your project's critical path. These instructions are specific to Project 2007. To verify that adjustments that you make to the project plan don't adversely affect the critical path, you can review the critical path and critical tasks in any of several ways. Note: By default, Project 2007 does not display a project's critical path. On the View menu, choose More Views > Detail Gantt, and then choose Apply. On the View menu, choose Gantt Chart, and then select Critical in the Filter list on the toolbar. To display all tasks again, select All Tasks in the Filter list on the toolbar. You can also group all critical tasks together. On the Project menu, point to Group by, and then select Critical. On the View menu, choose Gantt Chart, and then choose Gantt Chart Wizard on the Formatting toolbar. Follow the instructions in the Gantt Chart Wizard to format the critical path. 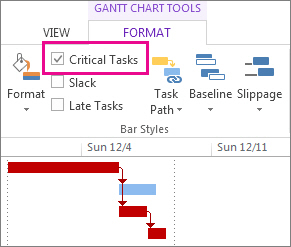 By default, the Gantt chart bars and link lines for critical tasks are displayed in red. This format change overrides any direct formatting changes previously made to bar styles or to individual bars. Note that this formatting of critical tasks applies only to the current Gantt Chart view in the current file. To use the same formatting in another file, you can use the Organizer (Tools menu) to copy formatted Gantt Charts to other files. On the Tools menu, choose Options, select the Calculation tab, and then select the Calculate multiple critical paths check box. Important: This procedure is only effective in a consolidated project. If you don't have a consolidated project, you must first create one. On the Tools menu, choose Options, select the Calculation tab, and then select the Inserted projects are calculated like summary tasks check box. This is a project-level setting. All projects inserted into this project will be calculated like summary tasks. In Project 2007, a critical task has zero days of slack (float). However, you can change this default value and define a task as critical that has, for example, one or two days of slack. On the Tools menu, choose Options, and then select the Calculation tab. In the Tasks are critical if slack is less than or equal to box, enter the maximum amount of slack, in days, that you want to use to define critical tasks. If you want this value to be the default value for all of your projects, choose Set as Default. To learn how to find a task's slack, see Show slack in your project. For instructions about changing a task's slack, see Set lead or lag time (float) between tasks. Tip: To change the sensitivity of critical tasks, on the Tools menu, choose Options. On the Calculation tab, under Tasks are critical if slack is less than or equal to, specify the number of days under which a task will be considered critical. When you display the project's critical path, Project 2007 shows only a single, overall critical path, which is the only critical path that controls the project's finish date. However, you can set up your plan so that you can also see an additional critical path for each independent network or each series of tasks. You might find this useful for keeping track of each of the subprojects within a master project, or of each phase or milestone of a project that is divided into multiple phases.